We have gotten past the first quarter of the year and what a crazy ride it has been already. I really feel like this will be an establishing year for my artwork, once I finally get life settled. Right now, I am aiming to focus on developing my exact style which will be used for my fursuit making technique. As it is an experimental endeavor, I expect to have a lot of trial and error. I’m ready to move to the next step with getting the fur and other materials. I plan on sharing each day that I work on this project, so be sure to follow along! I am currently selecting the fur that I will be using for my Nova costume. For the moment, I want to stick with only doing a partial costume, one that can be worn with normal everyday clothing, as well as other costume outfits. I can’t say for sure if I will ever want to do full body suit costumes. We will have to see, I suppose! Anyway, I went through around 25 shades of brown faux fur swatches, checking length, thickness, breathability, weave durability, and so forth. There are so many choices, and thankfully because of that, I don’t think I will have need of much airbrushing for my character. I can’t say for sure if I will want to do airbrushing with my suits. I rather like the idea of not needing to worry about washing off airbrushed markings. And here we are! My choices. I reduced the number of colors I would need to buy, from five to four. I'm going with Mendel's Punky Muppet in 4 hues: Chocolate, Mushroom, Vanilla, and Off-White. I may have to do some blending, but I like where this is at. I was possibly going to add Fawn Brown because it was SO luxuriously soft, but It wasn't enough of a contrast, and it would just mean more extraneous sewing that I felt would be unnecessary for my character. I'll be ordering the fur soon hopefully. (Before the month is done if I'm lucky.) As I have been saving up as much money as I could over the last few months. Originally that fund was going to go towards commissioning someone else to make this for me, but I thought more and more.... I could do it if I were to really put my mind to it! Before I get the fur in bulk, I also will be working on the other side of this costuming business that I had in mind. Which is that I want to make a masquerade mask that will fit over the fursuit mask itself. Something elegant and formal. If everything goes as planned, then this will be something I offer as a bonus to anyone who commissions a costume from me; a fursuit-fitted masquerade mask with every order! This may sound hammy, but I have always enjoyed the thought of a formal fursuit masquerade ball. That is where my subsidiary business name even came from, “Masqfurade.” It’s amazingly exciting to see it coming to fruition. Below is a quick concept of what Nova's masquerade mask might look like when I am finished. Happy Fursuit Friday! It feels crazy to be able to say that as an.... almost participant! Let me share with you what I have been working on today! As you all know if you read my post on March 6th, I finally got a mask in the works. It was delivered today and I couldn't wait to get to work on it. Materials: sculpey clay in 4 or 5 colors, plastic ornaments, pearl powder. Now, this is a mix of techniques, using layers of clay to build a cane. Next, I sliced the cane until I had enough pieces of the cane cross-section to form a circle of the appropriate diameter. Once the circle is made, work on fusing the sides between each chunk. Once done, texture with various clay tools. Bake according to the instructions for the clay. Brush the ridges of the iris with pearl powder to make it pop. Then mount the pupil in one half of the plastic ornament. My next dilemma however is to decide whether or not I want to do the scleras light or dark. I'm not sure yet. But all of that can be settled later down the road. I'm just so enthused with how the iris looks so textured! Here's a little video of it before I baked the clay. Next, I wanted to see how it would look with some eyelashes mocked up on the mask itself. Here's how it turned out! So that is as far as I got today! Those eyes are pretty labor intensive. I've got a long way to go, but it has been an amazing start to my fursuit-making journey! Masqfurade! Plastic Faces On Parade! If you remember back to the beginning of last month, I talked a little bit about this, but I am very excited to introduce the next step in finalizing my learning process for making fursuits. 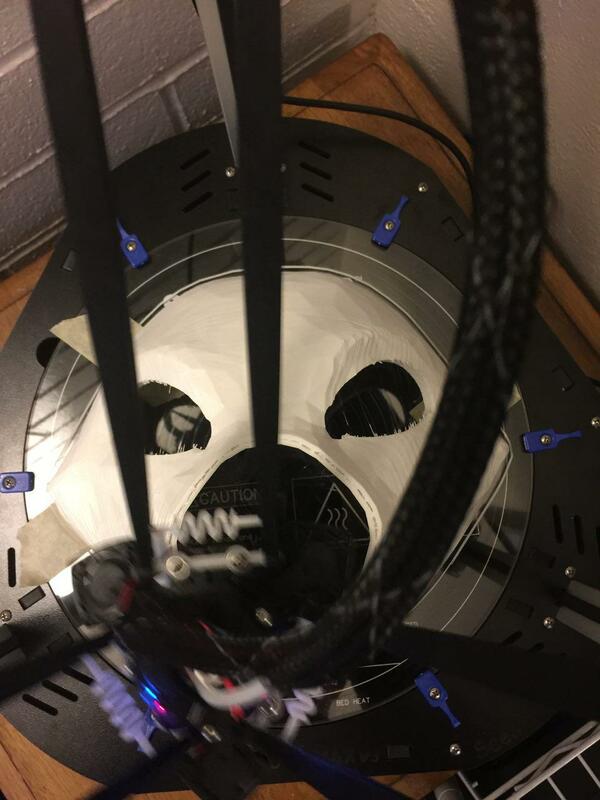 Thanks to my friend Talon Windstryke, who has graciously worked with me on printing my 3D sculpted mask. Thanks to his help, this is the result! 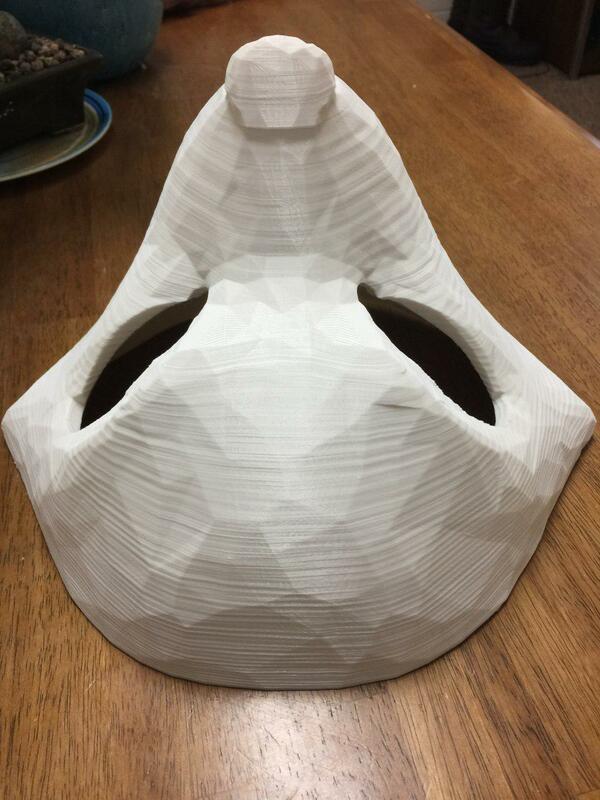 Completed Nova Nocturne Mask Print! It needs a little sanding and smoothing, but from what Talon said, it is very lightweight. I'll have to get a good set of tools to do some of the work on it (such as cutting out the jaw, and figuring out hinges and so on). I think I may try to do the eyes in the method Kazul of Kazplay, like her Graymane cosplay's eyes. I feel it would give Nova a really lovely, focused appearance. When I finally have the piece in hand, I'll be able to better determine what I want to do for the teeth, as well as If I can squeeze in a fan for ventilation. I know its odd that I had the full shape of the points printed out for her. This is mainly a test to see what I can do to make it work. Be sure to check out the printing process pictures! Now, because this is a project that will take time and money, I may open up sponsorships to involve my awesome followers and allow them to get some art in return for their support of this project. These sponsorships will only open up once my current list of commissions is finished. I look forward to seeing how this all plays out and I hope that this fursuit making attempt is a success!